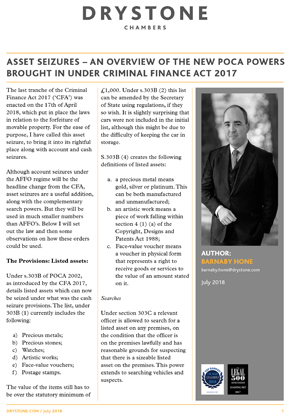 The Criminal Finance Act 2017 (‘CFA’) introduced a range of new powers prosecuting authorities can utilise, of which defence lawyers need to be aware. One significant area of change has been forfeiture and seizure. In the following article, Barnaby Hone discusses asset seizure. In particular, the areas of change and what now constitutes ‘listed assets’, how the test for forfeiture and realization needs to be approached and issues arising from the new provisions.